The stable has been represented by three very nice winners this week, But It's True, Vandancer and Battle Zone showing plenty of natural ability - impressive breaking their maidens. Proving a class above his rivals when debuting at Warrnambool on Tuesday, But It's True (pictured) could not have been more impressive racing away by a stunning six lengths. "He was a bit tardy out but he mustered speed well and box-seated," rider Jamie Mott said, "and once he let down he really put them away easily." "There is improvement in him," he added - "he is still pretty raw. The team have got a nice horse there." A son of one of our favourite stallions High Chaparral, But It's True is out of the dual Listed winning Pentire mare Pennacchio and is raced by the Payne family. "He has come out of the box a bit," Michael Moroney said. "Apart from one jump-out win at Werribee he has not shown much but he won like a good horse and he looks to have a real future. His time was quick compared to the other races and a race like the Mornington Guineas looks a good aim for him." Vandancer was having her fourth outing when recording a 2 1/2 length victory at Pakenham on Thursday, always travelling nicely slightly better than midfield before giving a strong kick half way down the straight. "It was a good win," jockey Mark Zahra reported, noting that "she did not have much luck at her last start - but she had the perfect run today." "I thought that the second horse actually got on top of me but when I shook her up she was able to get away. She probably hit the lead a bit too early but she was strong to the line. Raced by Eliza Park International, Vandancer is a full sister to the Listed winner Queen Sabeel by Savabeel out of the city winning Carnegie mare Vanessatheundressa from the family of the great Vo Rogue. "We thought she would win after she ran into bad luck at her previous start," Moroney said. "She will now head to South Australia for the Oaks races but we haven't yet figured out how she will get there." A short priced favourite at Donald on Friday, Battle Zone was another easy Ballymore winner, the son of Zabeel always in control stepping up to a mile second up, saluting by a soft 1 3/4 lengths. "It is always good to win for Michael," said Jordan Childs - "he gave me my first city winner." Taken by the style of Battle Zone's victory, Childs said that he was "always confident that he would give a good kick." 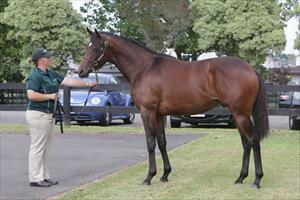 Purchased by Paul Moroney at the 2014 Karaka Premier, Battle Zone is out of the dual Group winner Katy Keen. "He won really well," Moroney enthused, describing Battle Zone as "a nice sort of staying horse with real talent. He too will be heading to South Australia." Hopefully the run of fortune continues over the weekend as we have three very nice chances at Flemington kicking off with up-and-coming filly Daniela Rosa in the Gr.2 Kewney Stakes. "It looks like being a tactical race and a strong field but we have been really happy with her and if things go right for her she could prove hard to beat." A runaway winner at Sandown last time out, Daniela Rosa left some smart types in her wake and the runner-up Data Point has franked her form with a terrific run in last weekend's Randwick Guineas. Later in the day another of our classy three-year-old fillies in Alaskan Rose lines up in the Gr.3 Schweppervesence Trophy - suited by the step up to the mile. "She is absolutely flying," Moroney said. "She ran the fastest last 400m all day last time out. Barrier three might be a bit tricky as she does like some room but she is well weighted against the older mares." Contesting the final event, the Listed 1400m event, Yesterday's Songs looks nicely primed third up. "This looks the right race for him, he has a good barrier, is well weighted and there has been a bit of rain about. We expect him to finish right in the thick of things."